Dylan: Why do craft breweries not use twist-off bottle caps? Bob: There are several reasons why. 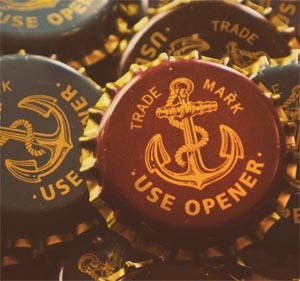 From a marketing perspective, twist-off caps have sort of a down market/ big brewery/ domestic lager/ light beer image associated with them in the eyes of the craft/ import consumer. Imported beers all have pry-off caps, which supports an image of quality. Craft beers likewise. The practical reasons are a bit more specific. Screw caps are crimped onto the neck of the bottle the same way they are for pry-off caps. The bottle top has threads molded on, and the threads on the cap are formed by the crimping process. In some cases, this does not create as tight a seal as a standard pry-off closure, nor does it provide an optimum oxygen barrier. Furthermore, twist-off caps can loosen during certain packaging and transport scenarios where a pry-off will not. This is of great importance. For smaller craft breweries, there are a few other issues involved, such as the need for generic bottles or the use of older or less sophisticated bottling lines not ideally suited to this technology. There have been instances where craft breweries have changed to twist-off and then switched back for one or another of these reasons. However, there might still be some craft twist-offs out there that I am unaware of. I used to hear about Anchor’s lack of a twist-off cap, but not much anymore. It was just a convenience issue anyway, and I always felt that those folks were probably recent converts and were in an adjustment phase that they would soon transcend as the full experience of the wonderful world of craft beer opened up to them. By the way, I never, ever heard anyone talk about the lack of twist-offs on Mexican or Dutch beer bottles. Mark: Is Bob Brewer really your name? This question may be off base for a beer blog, but I know that Anchor makes fantastic distilled spirits as well. I know that Rye/Whiskey/Bourbon get their color from the barrel. My question is; do distillers ever use roasted grains beyond the base malted level to attain a different degree of aroma, color or flavor in the final product? Similar to the brewing process; adding quantities of darker roasted malt will alter the color and flavor profile of a beer recipe. We decided to consult Bruce Joseph, Anchor’s master distiller, on this one. He told us that some whiskey distillers are using darker roasted malts and grains to achieve different flavor and aroma profiles in their whiskey. But, darker roasted grains don’t contribute to the color of new make whiskey. All whiskey spirit is clear coming off the still and picks up its gold to amber color from the barrel it’s aged in. And there you have it! Thanks for your question!